Reminder: Never Before Seen Sale Ends Tuesday, September 30th! Sorry to disappear for so long, but I was having some trouble logging in to typepad and things are so hectic right now that it took me longer than usual to get it fixed. I wanted to announce a promotion I'm holding now through October 16th (my birthday) at 9pm in celebration of the new Online Ordering!! The first 5 people to place a Stampin' Up! product order of $40 or more (before s&h) from my site will receive a FREE handstamped gift from me! To place your order please click on the box on the right that says Order Online. This will link you to my website where you can click on the Shop Now button to browse the catalog and add items to your shopping cart. I hope to have a bunch of new projects to post in the next few weeks, so check back soon! Thanks so much for your support!! Let's Celebrate with FREE Stuff!! It is time for me to unveil my One Year Anniversary Promotion that I have been planning. This month marks my One Year Anniversary as a Stampin' Up! Demonstrator!! It has been a great and inspiring year, and I can't believe a whole year has gone by already! I would like to thank all of my customers, fellow demonstrators and all the other people who frequent my blog for their support, kindness, inspiration and friendship. Stampin' Up! really is a giant family and I'm glad to have become a part of it! Now to the promotions I have planned for September-December to celebrate! Be sure to read them all--you don't want to miss out on all the FREE stuff!! - Leave a comment to this post and you will be entered into a monthly drawing (September-December) to receive a package of Blog Candy (a mixture of various embellishments including ribbon and pieces from various kits)! Make sure to include your email address in your comment so that I can contact you if you win. I'd love to hear your different ideas, tips, tricks, inspiration, favorite products or what you'd like to see here on my blog. I'd love to make this a place where you come to get inspired, share ideas and gain information--so tell me what you'd like to see and I'll do my best to meet your needs! - Anyone who books a party to be held in the months of September through December will get to choose a FREE gift from me when we close the party! - Any hostess/host that has a party of $300 or more in products can choose any one item from the catalog $16 or less to receive for FREE or any item $32 or less for 1/2 Price in addition to their hostess benefits! - Any customer that refers a new customer to me will receive a FREE gift from me (make sure they tell me you referred them)! The same applies if you bring a guest to one of my classes that has never been to one of mine before (please make sure to have them RSVP so I make a spot for them)! - Anyone that places a personal order of $100 or more will get their name entered into a drawing to win a $20 gift certificate and FREE products! You can be entered more than once if you place more than one order of $100 or more. There will be 4 winners all drawn at the end of December. The first place winner will receive the $20 gift certificate and the 3 runners up will receive the FREE products. - Anyone who purchases a Big Shot anytime in September-December will be invited to attend a FREE special class on how to use the Big Shot, make a few projects and receive a brochure of ideas for projects to make with it. - Anyone who signs up to start or join a Club (cardmaking, 3-D, scrapbooking or technique--or a combination of all 4) will get to choose a FREE gift from me at the first club meeting! I currently do not have any Clubs as this is something new that I'd like to start offering. If you are interested in starting a club or joining one when I get another one started please let me know. 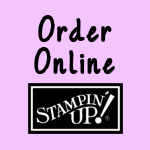 - Anyone who signs up to be a Stampin' Up! Demonstrator under me from September through December will get to choose a FREE stamp set ($40 or less) from the catalog OR a FREE set of Stampin' Write Markers in a single color family (Bold Brights, Earth Elements, Rich Regals or Soft Subtles) and a FREE set of Neutral Stampin' Write Markers!